The issue is not a lot of travel plans would not really have Thonet Haz in their lists. But there is all the chance in the world that if you are passing through this area, you will witness the beautiful house tucked inside. The building goes up to three storeys and is located on the pedestrian side. The building style of this place is unique and first of its kind in the neo renaissance era that defines architecture. All in all, you should just simply drop by to completely live the simplicity in all the beauty. For interior visit, seek permission. You can visit the house from outside anytime of the day. How popular is Thonet Haz? People normally also visit Kapucinus Templom while planning their trip to Thonet Haz. Not really worth a look. If you have seen this on Instagram then be aware the colour has been enhanced! 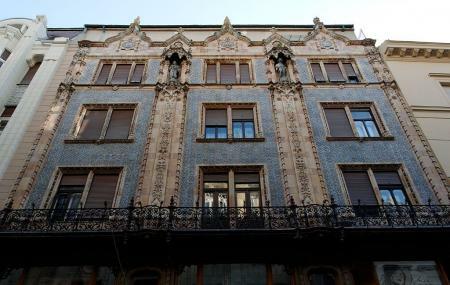 Edificio a quattro piani, in stile secessionista ungherese (Art Nouveau) rivestito con piastrelle blu della Zsolnay. Fu costruito tra il 1888 e il 1889, come negozio della Thonet ,azienda viennese produttrice di mobili e progettato da Odon Lechner.